Looking for some fun Cinco de Mayo activities for kids? Try hosting your own small Cinco de Mayo party either just for your family or have your children invite a few friends over to celebrate. Cinco de Mayo means “fifth of May” in Spanish. It is a day for celebrating Mexican heritage. This is a day of celebration with so many fun possibilities! For decor, use a lot of bright colors with table linens and dinnerware. The Mexican flag is green, white & red and you can incorporate these colors with balloons and streamers. There are many delicious food ideas for a Cinco de Mayo party. You could create a buffet style with a make your own taco, burrito, fajita or quesadilla bar complete with salsa, guacamole, sour cream, cilantro, a few hot peppers, spiced meat, beans, corn, rice and shredded cheese. If you are looking for Cinco de Mayo activities for kids leading up to this special day, try this free printable Cinco de Mayo word search. A pinata is a must have for a Cinco de Mayo party! It’s a great decoration and a fun fiesta activity as well. Fill your pinata with candies and small toys. 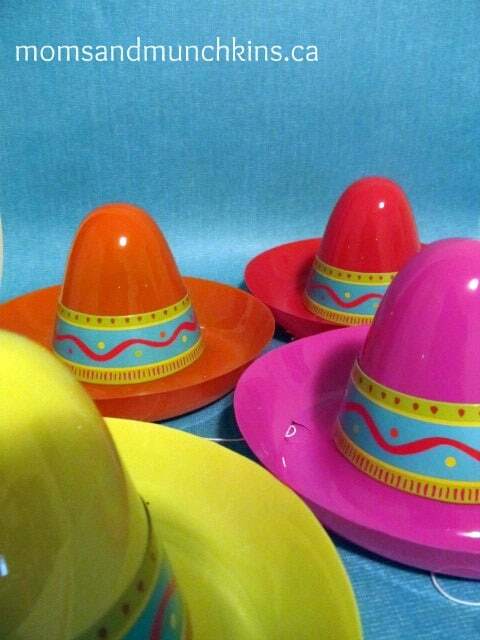 Your local party store will have fiesta cut-outs, mini sombrero hats and maracas for added decoration. Your children could help you with decorations by coloring a few fiesta party coloring pages. Be sure to pick up a CD with fiesta party music so the kids can have fun dancing at your Cinco de Mayo party. You could try a Mexican Hat Dance as well – lay a sombrero on the floor and everyone dances while walking around the hat in a circle, call out 1 person’s name and this person moves to the middle of the circle to dance until the next person’s name is called out, then the first person can return to the circle walking around the hat. We’re always adding new ideas for holiday fun. Stay updated by following along on Facebook, Twitter, Pinterest and Bloglovin’.